There’s something about the Lacoste brand and products that I love: they’re well-designed, detailed and minimal. 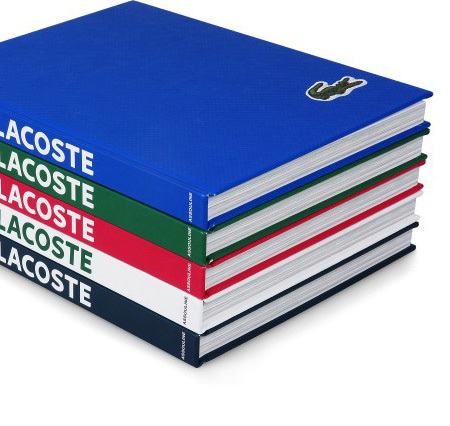 So I’m excited to see that these concepts were extended to their new book, Lacoste: The Element Of Style? by Olivier Margot?. The book presents the visual history of this classic brand in a well-designed package. I personally love the simple design of the cover — which comes in 5 different color-ways — and the canvas texture. I did some quick searching and couldn’t find any info on the designer of the book. I wonder if Lacoste did it themselves. You can grab a copy of the book from Amazon or Assouline?. 6 Comments on "Lacoste: The Element Of Style"
The logo on the cover seems to be the enbroaded logo, the same as the one on the polo shirt. I must have spent hundreds on Lacoste over the years, in fact I’m wearing a polo shirt today! These books look exactly like their clothes. Modern, colourful, fun, simple. Assouline (the publishing house) did the design of the interior of the book, I did the exterior and put forward the idea of having multiple covers, like a multi-color pile of polos.